Tricks, routines, sleights and techniques! Learn lots of tricks and routines, sleights and secret techniques! HARD TO FIND BOOK! This is an OUT OF PRINT book. CONDITION: very good- some wear to the cover. No dustjacket. You will receive the exact book in the photo. 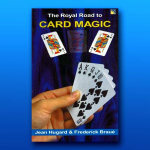 One of the most popular experts writing on magic today here presents over a hundred brand-new tricks. They are subtle, easy to do, and require little or no apparatus. 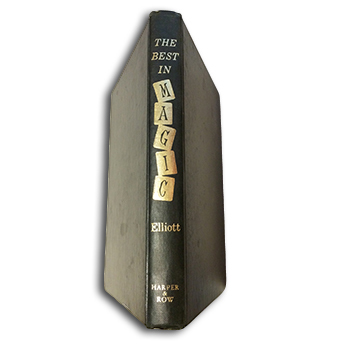 The inventions of some of our greatest magicians, these are sleights that involve a minimum of practice but achieve a maximum of effect. Here are card tricks that are almost fool-proof, and others that require some skill and more practice. Sleights for close-up performing, where the magic takes place right under the noses of the audience, and tricks with paper-folding, an ancient art adapted to modern magic, are outlined and shown in diagrams. 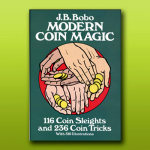 The author also includes tricks with coins and paper-money, rings, ropes and silks. Mr Elliott reveals how the 'expert' at the card table operates; and he exposes the secrets of 'mind-reading'. 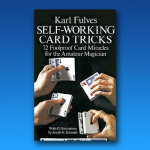 The final section of the book offers several routines that incorporate a series of deceptions, particularly useful for the amateur magician who expects some time to be on stage. Sixty-eight full pages of how-to-do-it line drawings illustrate these tricks.